Been there, done that. That’s how she was feeling about the front lawn. The kids are grown and so are the grand kids, but my client, Marie, is as busy as ever with her many interests and lots of entertaining. She has maintained the classic front yard swath of green grass for many years, but now, with her daughter’s encouragement, she was ready for something different. 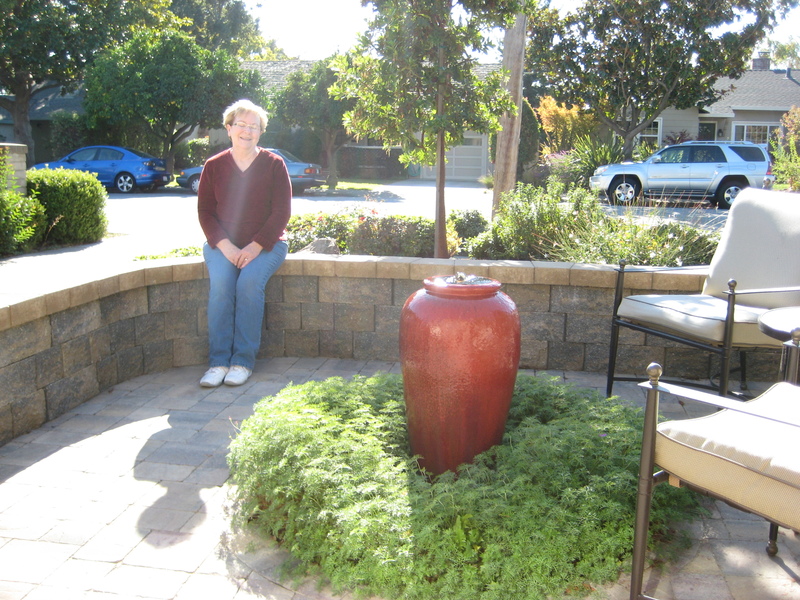 Here is the list of what Marie wanted in a new front yard; low maintenance, low water use, privacy for a front bedroom, and a way to block the view of a telephone pole from her front window. After evaluating her site and asking more questions about her lifestyle, here’s what I thought she could use in addition to her requests; a more gracious entry, a path to walk to the front door that didn’t squeeze along the driveway, a reinforcement of the red and gold color scheme inside her home, and a second foot path for guests who may park a second car in the driveway. 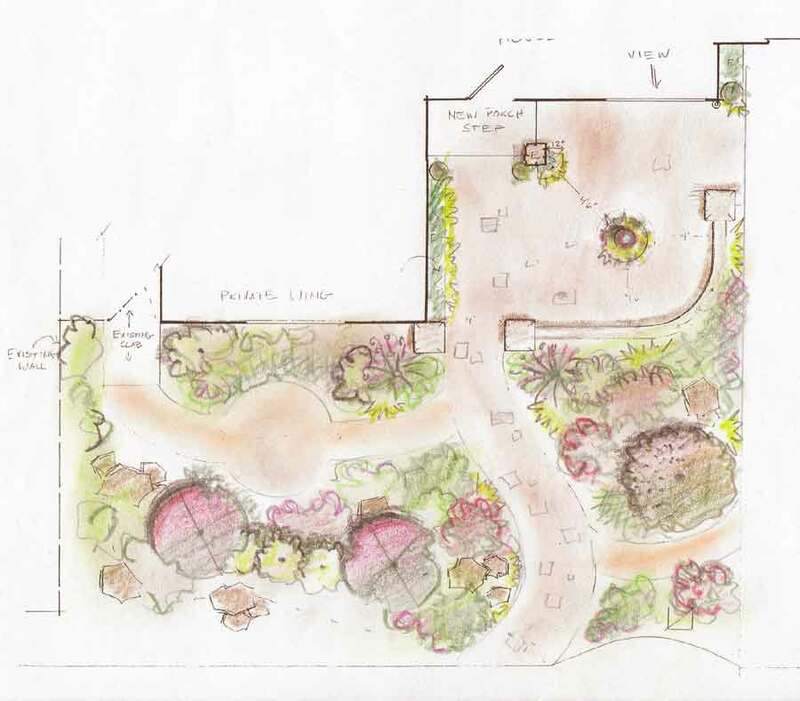 Marie immediately agreed that these ideas would establish the functional but beautiful garden she was hoping for. So, after taking measurements and creating a site plan, I went to work designing something specific to fit her needs and her space. 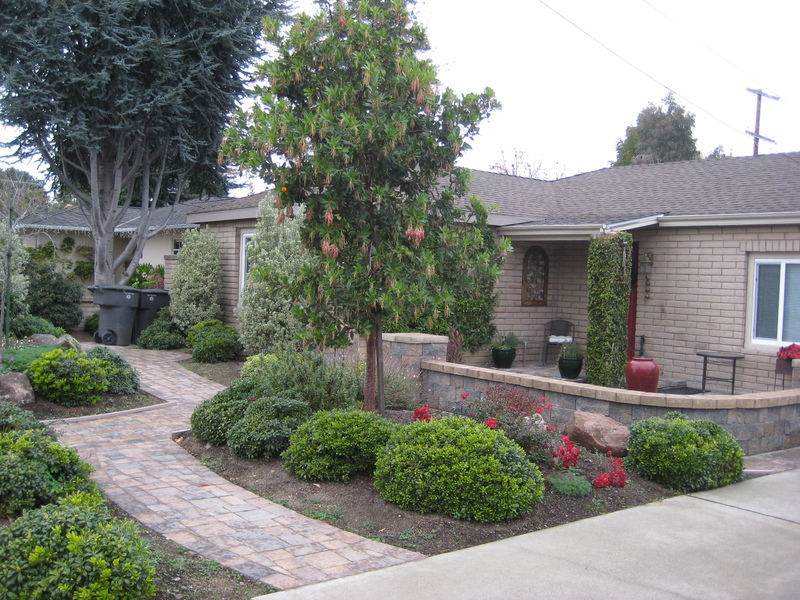 A really common challenge, when removing a front lawn, is how to use all that space in a meaningful way. 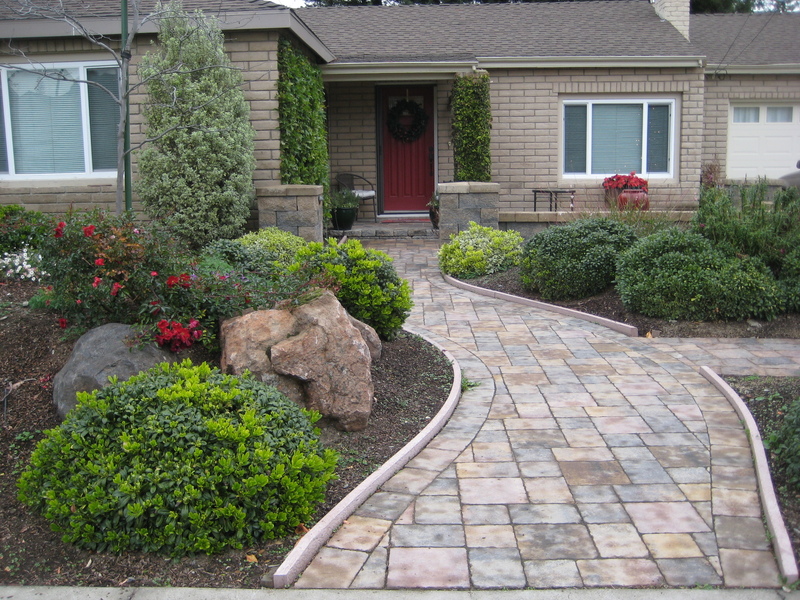 Sometimes it works to keep a large green space by simply switching to a drought-tolerant groundcover or low-water grass instead of a lawn. More often, it makes sense to re-think how you want your space to function. There is certainly the movement to convert front yards to edible gardens and I love the challenge of doing this, but that was not the right solution for this situation. In addition, I saw that neatness is very important to Marie. While she likes the “natural” look in theory, what Marie really wanted was something a bit more classic. 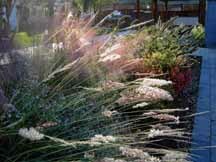 Fortunately, an ecologically appropriate garden and classic garden styles are not mutually exclusive. In this case, it really was an example of form following function. So I made a diagram of how people would move through the space and developed several specific designs based on an ideal flow. The solution for Marie was to create an entry courtyard that gives her and her guests an improved experience getting to the front door. A fountain, in the courtyard, sets the tone for the gracious decor within the home and also brings a focal point to the asymmetrical space. This is important both for how the garden is seen outside but also for creating a pleasing composition as seen looking out from the living room window. 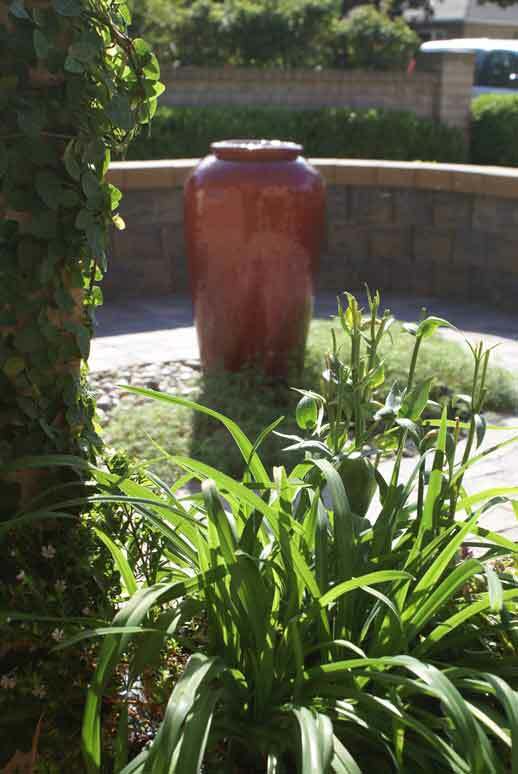 A low courtyard wall, surrounding the fountain, is used for impromptu seating, and creates an inviting space for welcoming guests, or more commonly, for lingering goodbyes. The low wall also creates a psychological barrier between the street-side “public” part of the garden and the beginning of the “private” space closer to the house. The planting areas outside the courtyard got some gentle height with mounds and berms which add to the sense of privacy we are trying to create. I added a new path, from the street, that didn’t exist before. This creates a practical and more welcoming way to get to the front door without going along the driveway. The path gently curves around a group of boulders, so that the journey is inviting yet prevents a straight view into the front door from passersby. In addition, I added a path for guests in a second car as well as “breathing space” in front of the bedroom wing and access to a side gate. To honor Marie’s preference for classic neatness, I chose a plant combination that relies on several varieties of Pittosporum for year-round form. These evergreen “bones” are interspersed with fast-growing, textural plants that help fill in the space in the first year but can be edited out as needed. Taller shrubs are strategically placed for privacy, especially along the bedroom wing and to block the view to the telephone pole. Long-blooming but low-maintenance landscape roses, in a deep red shade, compliment the new front door, and add emphasis and color. A few additional touches, like lighting and clinging vines, soften the tan, brick-like exterior. Several strategically placed pots and some entry art finish off the space. The environmental benefits of this re-imagined garden are; dramatically less water use, a little seasonal pruning versus weekly lawn care and diverse plantings that make for better habitat for birds and beneficial insects than the previous swath of grass. By designing a space to follow the actual and imagined uses of the gardens occupants, the garden becomes so much more than the sum of its parts. As Marie lingers with her guests around the gurgling fountain, I’m hoping that she thinks about nothing more than how pretty the plants look and how nice the sun feels on her back.